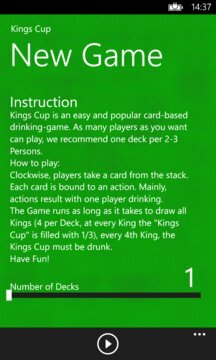 Kings Cup is an easy and popular card-based drinking-game. As many players as you want can play, we recommend one deck per 2-3 Persons. Clockwise, players take a card from the stack. Each card is bound to an action. Mainly, actions result with one player drinking. 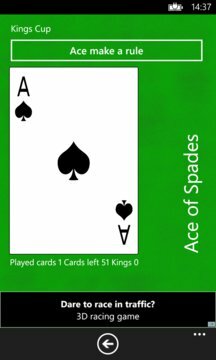 The Game runs as long as it takes to draw all Kings (4 per Deck, at every King the "Kings Cup" is filled with 1/3), every 4th King, the Kings Cup must be drunk.